Recently John Stamos appeared on "Watch What Happens Live". 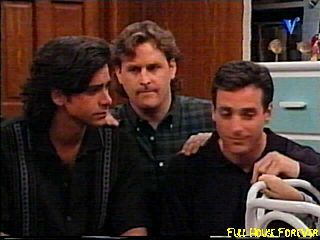 In this show, he gave Full House fans new hope to see their favorite characters back on TV. When a caller asked if a Full House reunion would be happening, John Stamos confirmed that the wheels for some kind of Full House sequel have been set in motion. "The legacy is so important to us," John replied to the caller's question. "Every year, it gets deeper and more meaningful and important to everybody. We just have to do it right. We're sort of working on a twist on a sequel, but we don't know if it's going to happen yet or not." Although there's no certainty yet that a sequel of any kind will be broadcasted in the (near) future, it's good news for the fans that there are some plans that are being worked at to possibly return to our favorite family from San Francisco! This news comes in a time that gave us a couple of cast reunions, starring John Stamos, Bob Saget and Dave Coulier. Not only did they appear in the new Oikos commercial, they also resumed their roles on Full House for a guest appearance on "Late Night with Jimmy Fallon".